The aim of pharmacogenetics is to know the predictable response of a drug, based on the genetic characteristics of the individual. Pharmacogenetics intend to anticipate differences in pharmacokinetics and pharmacodynamics due to polymorphisms in genes related to absorption, metabolism and mechanism of action of drugs. Getting an efficient personalization of the treatment. Improve the success rate of the therapy and prevent the occurrence of adverse drug effects. After more than 20 years of research in the field of pharmacogenomics, our goal is the clinical movement of pharmacogenetic biomarkers approved by medicine official agencies and with clinical evidence and cost-effectiveness. Currently, FDA and EMA regulatory agencies have issued mandatory or appropriate recommendations that encompass more than 100 pharmacogenetic biomarkers(DNA, RNA or proteins) in more than 60 drugs. However, the movement of pharmacogenomics is still difficult due to different factors, including educational issues (lack of updating knowledge about pharmacogenomics), organizational issues (different biomarkers analysed in different hospitals and services) and in most cases, the lack of cost-effectiveness studies and regulatory approval. The establishment of multidisciplinary and lasting collaborations with teams of doctors and pharmacists to promote and coordinate various projects of clinical movement of pharmacogenetics, particularly in the areas of oncology, psychiatry and cardiology. The dissemination of knowledge. The head of the group has been a member of the EMA Pharmacogenomics working group and he contributed to the establishment of a common biomarkers validation system for FDA and EMA. He also promoted the creation of the Spanish Society of Pharmacogenetics and Pharmacogenomics (SEFF), being an active member of society. 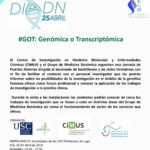 The Genomic Medicine Research Group places all its experience and know-how in the determination of genetic polymorphisms associated with the response to drugs at the service of the medical and scientific community, as well as its expert advice on the information that may be provided, both in the choice of the drug, as in the first dose adjustment for patients and in their later monitoring.